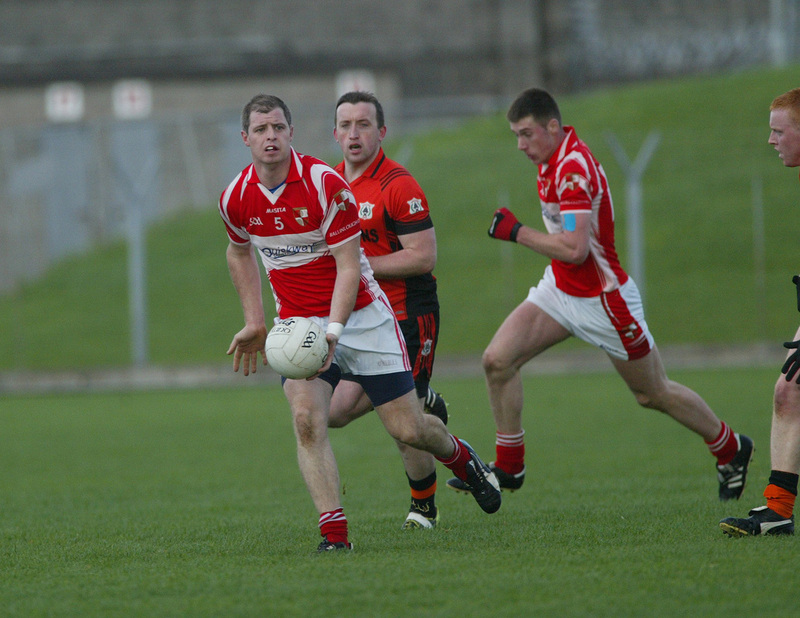 Ballinlough got the better of Meath Hill in the first round of the B-League on Friday night. The game was played in the impressive surrounds of Ballinlough’s new pitch facility, which allowed for a free flowing game of football, when so many other pitches are unplayable at this time of year. The home side have performed well in this competition in recent years, and fielded a very strong side for this encounter. James O’ Higgins opened the scoring for the ‘Lough in the opening minutes, with a perfectly struck 45, which earned him the historic honour of scoring the first point in a competitive game in the upgraded pitch. He soon converted another free to increase his sides advantage, before young corner forward Adam Fox finished off a good team move instigated by Ken Rothwell. Meath Hill responded soon after with their opening score from a free kick. O’Higgins got the momentum back with the Reds with another sweetly struck 45, before Lorcan Maguire split the posts with a sublime score off his left boot. A late flurry of scores by the visitors before the break reduced the deficit, and saw the teams go in to half time with the scores at 0-06 to 0-04. Ballinlough dominated possession completely in the second period, but a succession of wides meant that they never pulled away from their opponents. Great fielding in the middle of the park by Maguire and Kevin Beirne meant that Meath Hill struggled to build any meaningful attacks, while extra attacking impetuous was added by Benji Smith, James O’Keefe and Dylan Montgomery Francis who were tireless in attacking from the back, while not ignoring their defensive duties. Rothwell and Maguire both pointed, after a succession of wides by their side, to steady the ship for the ‘Lough, before O’ Higgins capped a fine individual display with a well taken goal. Although Meath Hill tagged on a few late points, Ballinlough held on for a well deserved win. Ballinlough: L. Gibney, M. Farrell, E. Smith, J. O’Keefe, D. Montgomery Francis, B. Smith, J. O’Higgins, L. Maguire, K. Beirne, O. Brady, K. Rothwell, J. Montgomery Francis, P. Monaghan, D. Farrelly, A. Fox. Subs: J. Farrelly for D. Farrelly, M. McInerney for A. Fox, J. Lydon for O. Brady.